Jakarta – Divers searching for the wreckage of Indonesian Lion Air Flight 610 can no longer hear a signal from the aircraft’s missing cockpit voice recorder, the head of Indonesia’s Search and Rescue Agency said Sunday. Meanwhile, the plane’s first black box, the flight data recorder, was located Thursday, and investigators said it showed Flight 610 had performed 19 flights — including its final flight. Six black box experts from four different countries were now analyzing the flight data recorder to piece together the last moments of the new Boeing 737 before it crashed. 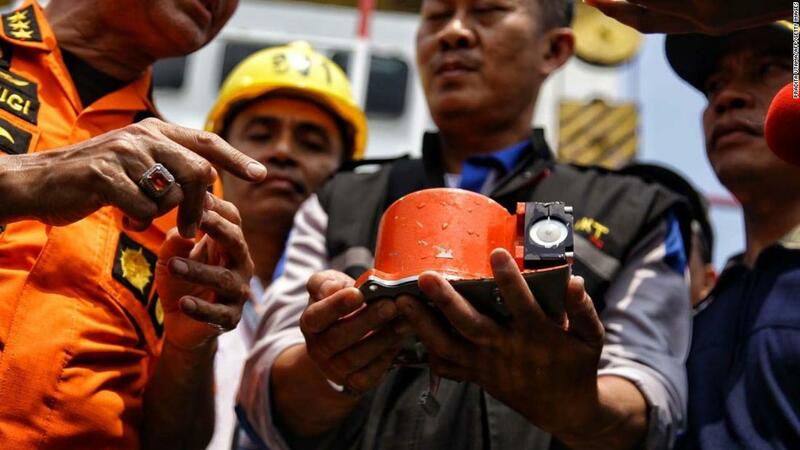 The ill-fated Lion Air flight JT 610’s flight data recorder was recovered from the Java Sea on Thursday. Flight 610 was supposed to take its passengers on a one-hour journey from Jakarta to Pangkal Pinang on the island of Bangka. Instead it crashed 13 minutes after takeoff. The pilots had asked to turn around but didn’t transmit an emergency call. At least 65 body bags have been gathered since the start of the search-and-rescue operation, though each bag could contain remains of more than one person. Investigators will have to rely on DNA samples to identify victims because of the condition and size of the remains found. Police have 181 DNA samples from victims’ families and are working to match them to 272 human tissue samples. Lisda Cancer, head of Disaster Victim Identification, told reporters Friday that just one person has been identified so far, a female, through a fingerprint. On Wednesday, authorities started bringing relatives to the port to identify victims’ personal belongings, which lay piled up next to cushions and other debris that appeared to be from the aircraft. Epi Syamsul Qomar, whose 24-year-old son was on the flight, broke down in tears when he recognized his son’s shoe. 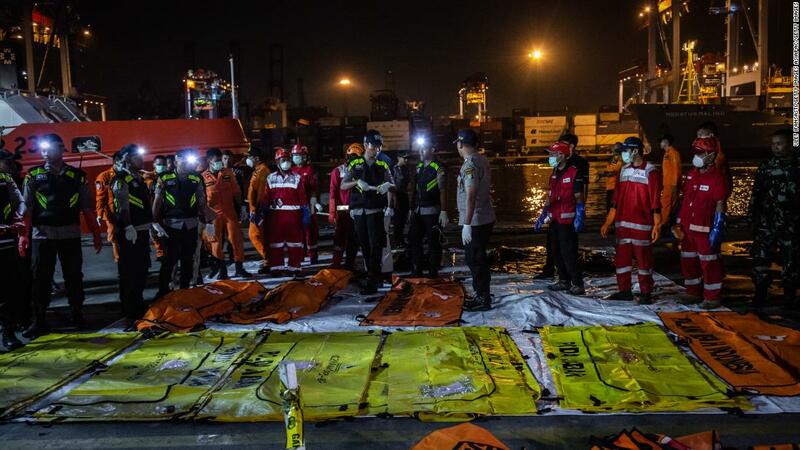 Body bags are laid out at Jakarta’s Tanjung Priok port on November 3. 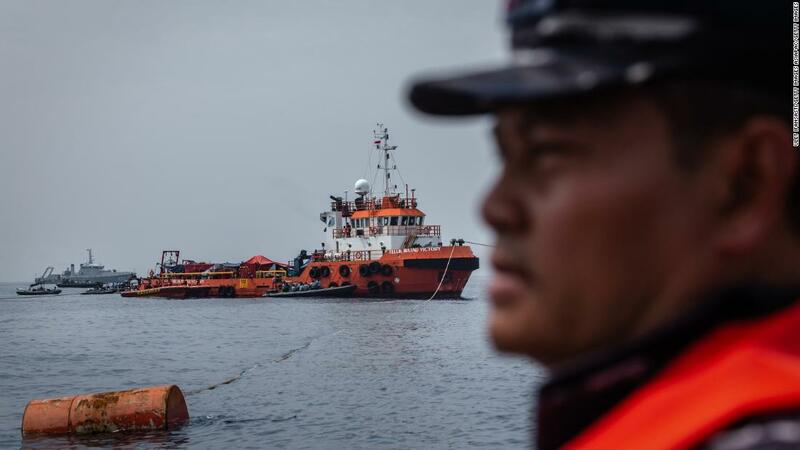 The fast-moving currents and muddy waters of the crash site in the Java Sea have hindered recovery efforts since the plane came down Monday shortly after taking off from Jakarta. Anto was a qualified, senior diver “who devoted his life for our country,” Syaugi said. Indonesian navy personnel searching for victims and fuselage of Lion Air Flight 610 Sunday. On Sunday the Boeing 737 Max 8 aircraft — a new plane, which had only around 800 flying hours on the clock — had flown Lion Air’s Bali-Jakarta route and had experienced a significant drop in altitude, passenger Robbi Gaharu said. Lion Air confirmed to CNN that the aircraft that crashed on Monday had been used to fly the JT43 Bali-Jakarta route the day before, and Indonesian authorities confirmed that the pilot on Sunday’s flight reported a problem with one of the plane’s instruments. Capt. Daniel Putut Kuncoro Adi, managing director of Lion Group, said that all information had been handed over to Indonesia’s National Transportation Safety Commission and he could not answer any questions about the fault because of a nondisclosure agreement signed to accommodate the investigation.